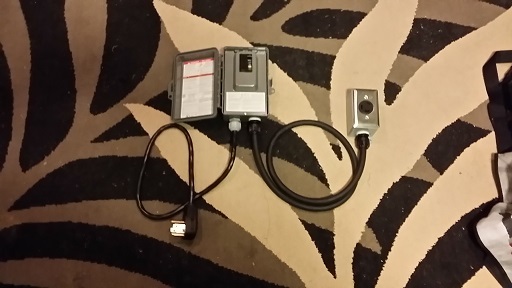 Alright, so I asked bunch of questions and got no answers on the forums, so I started digging into it on my own and have figured out what is needed to make a portable GFCI for an electric brewery, and a basic understanding of how a GFCI breaker works within an electric brewery. I have decided that I am going to write down what I did and what I learned so that people may somehow benefit. So the GFI had to be three things: 1) portable; I can't leave it in place all the time, as the landlord uses the garage for his work as well. Plus I would like to take equipment I paid for with me if I leave this house. 2) Adaptable. I eventually would like to go to a full on Kal style brew-panel, so anything I use I want it to be compatible for later on. 3) Cheap. Not like “cut corners accidental manslaughter cheap”, but end of the day I need a solution that isn’t going to leave me feeling financially molested. So I went on the epic quest of trying to get answers about this stuff on the internet. I discovered four ways to do this. 1) Install new breaker, which is a hard no. 2) Have an professional electrician rig up a setup for me ($500.00 CAD friends and family rate), another hard no. 3) Buy an inline GFI connector, there are few companies that do this for 3-wire 240V 30amp setups, but it would be $350.00CAD shipped and it’s not really modular with future upgrades, gotta be a better way. 4) a DIY GFI system. I have found some pictures on other threads of people making these from Portable Spa Panels, this option potentially met all my criteria, so I started pursuing it. So after seeing a few pictures of what other people had done, it seemed like it might work, so I decided I would try my hand at it. I did a bunch of digging and found some plans that had been laid out by a member of a different brewing forum. The posts and diagrams I found kind of made sense so I kept on going and started to figure out the why’s what’s and how’s of this project. So I started by asking a bunch of questions and I didn’t get any answers off the forums directly, only partial answers here and there. With the help of a few friends in the electrical business, the internets, and books I managed to cobble together an understanding and made it happen. Because my brewing system is setup for 30amps, I wanted the spa panel, all the wiring and the plug-ins/outlets to be 30 amps. I wanted to make this as standard to 30 amps as possible so that I don't accidentally make a mistake with too big or small a wiring/plugs. I got on EBay and after a bit of patience I found a Square D QO 50amp GFCI plastic spa panel for 70.00USD shipped. This panel was pretty much what I was looking for, it was rated UL and CSA, which means no worries for Canada safety standards. However, it was 50amp, and I needed a 30 amp. Problem was, it was a damn good deal and I wasn’t really seeing any 30 amp panels. So this led to my first question, would it be okay to use a 50amp spa panel? So obviously the 50amp breaker would never trip because it is has too high of a current rating. 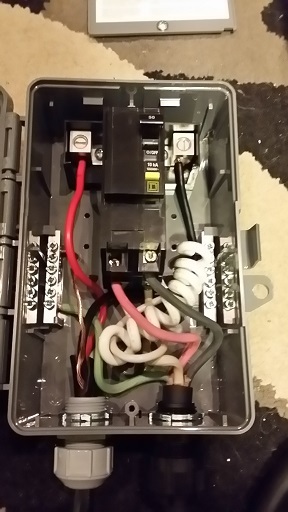 But the 50amp breaker would connect and get power from a 30amp breaker in the sub-panel. So will the 30amp breaker trip if anything connected to it overloads? After some searching and professional consultation, the answer is yes, the 30amp breaker will trip. As a result, the 50amp GFCI is solely for ground fault protection and is useable, so I bought it. So I got things together and got to work. I started by punching two holes through the bottom of the spa panel with a 1" hole saw. The panel had punch-out marks on the outside of the panel making it easy. From there I put a 3/4" grey strain relief through the left hole and chose the rubber sealing ferrule that fit the dryer cord. I then wired in the 4 wire dryer cord to the breaker, making sure to attach the GFI breaker Pig tail to the neutral bar (see goofy looking diagram for details) I then put in the 3/4" black strain relief on the other side, and put in the 10/4 SWOO wire in it and wired it up to the outgoing side of the panel. I had to use two different types of strain relief on the Spa Panel because the dryer cord was significantly narrower than the 10/4 SWOO neoprene wire, and needed a narrower strain relief. From there, I cut a hole in the 1 gang FS box for the second black strain relief, and ran the 10/4 SWOO into the box. I then installed l6-30R receptacle and plate into the box. Now, some of you may have noticed that the cord into the outlet box is 4 wire, and the plug-in itself is only 3 wire. I did this because my current controller is only 3 wire [url]http://www.theelectricbrewery.com/forum/viewtopic.php?t=28684[/url], but eventually when I upgrade my panel it will need to be 4 wire and I didn't want to have to buy the wire twice. So this begs the question; will a 4 wire GFI breaker work with only 3 wires hooked up to the plug? Based on the wiring diagrams that I had found on a different forum, it seemed plausible what I was doing wasn’t 1000% stupid, but I had an electrician buddy of mine walk me through how GFI's work just to be safe. Here is the simplified interpretation of what he told me - The GFI in a breaker constantly monitors the current flowing through each wire that comes out of the breaker against a set point. This is why the GFI breakers have that pigtail wire, the pigtail has something to do with the set-point. Now if any of the wires coming out of breaker managed to come loose and begin to ground out at any point along the path of the circuit that is not the normal ground, it notices this and shuts off. So for example, if you drop a hair dryer into a bath tub, the thing wants to ground out to the water, this energizes the water, and causes bad times for anyone that happens to be in the tub. 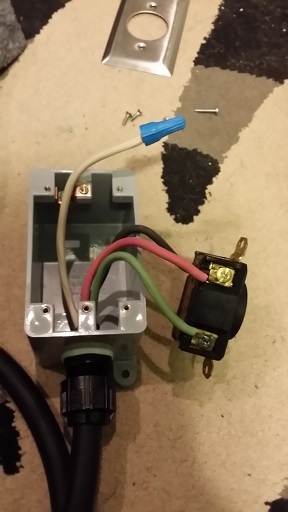 If the hair dryer in question is connected to a GFI, the GFI monitors this, senses that it is not grounding correctly and trips the breaker. Proper GFI's that are up to electrical code are capable of turning off so quickly that the electricity is shut off before the person in the tub can have a bad time. Now in the example above we were working with an appliance that only had two monitored wires, a hot and a neutral. In our case, we have 2 hots, and a neutral being monitored. In our scenario (an electrical brew pot), if the system were to ever short and ground out to something. It would most likely be the pot itself, which would energize to the wort and metal brew pot. If this happened, anyone who happened to touch the brew pot may have difficulty being alive anymore (That's a problem for me as I like being alive where all the beer is). If we were using an e-brew system like Kal's controller, where we have all 4 wires in and 4 wires out (HHNG) connected, everything would easy and it would work fine. Obviously this is not the case, as there are 4 wires going into the box where the outlet is, and only 3 wires (HHG) getting connected to the outlet. After another electrical consult, I was informed that the breaker monitors all the lines and can run without a neutral wire connected going OUT of the breaker. In order for the GFI to work, it needs the neutral hooked up going INTO the breaker, as this is how it monitors the set-point. This makes some sense as there are items that need GFI protection that only require 240V 3 wire (HHG) setup. For example, some hot water heaters, older hot tubs, Jacuzzi bathtubs, etc. So if you are going to have 4 wire going out of the spa panel to a 3 wire plug in, it needs to be somehow capped so it cannot accidentally ground itself out causing the GFI to trip. My electrician friend advised me to put a wire nut on the neutral wire and tuck it aside in the outlet box. So that’s what I did. From there, the portable panel was essentially finished, only thing left was to plug it in and test it. So I whipped out my handy electrical checking pen (a magical device that starts screaming when it detects a live wire near it) and systematically checked every point of contact one by one making sure that the breakers provided power when on and completely de-energized the system when off or tripped. It all seems to work according to plan, so the next step is to hook up my brew controller and try it out. I will keep people posted about my progress. It seems like this is wired up exactly like mine, which is the wrong way according to Kal's troubleshooting FAQ post. He says that the neutral from the main power line has to go to the breaker and the pigtail goes to the neutral bus bar. You have the main neutral going to the neutral bar, it seems. That's the same thing I have and it trips immediately, so just curious if you were seeing the same results and had to correct this. I think you might be seeing it wrong, the neutral goes to the breaker and the pigtail goes to the neutral bar... I have never had a problem with this system, works great. First of.... if you are using a 30 Amp breaker at the panel.... ALL the wiring past the breaker HAS TO BE rated ATLEAST for 30 Amps. It is a best practice to use "breaker coordination" to clear faults near the source... that being said, after some thought, I think you are OK using a 50 Amp GFIC 'down stream' ( I have done a few Coordination Studies on industrial buildings.... a program I used, called 'Easy Power', would hate your plan). Now...Ok I am really confused.... Are you running a Kal controller? I assume alot of things (PIDs, relays,pumps) inside the controller run off one of the hots and the neutral (120 volts)! By you running only 3 wires... Hot, Hot, Ground... there is only 240 Volt. Kal calls out to run a 4 wire system and bring in all 4 wires into the controller to be able to have 240 Volt AND 120 Volt. I agree with JSB. In lieu of capping off your neutral, get rid of the three prong receptacle and install a four prong. I think you are are essentially bypassing the GFI protection without the neutral. I figured out my issue. When I plugged in the dryer to test the GFCI panel, it tripped immediately. I believe something internal to the Dryer is shunting ground and neutral together causing the trip. It works perfectly with the Control Panel. I hope this topic is still being watched. First off thanks for the nice instructions on spa panel wiring. I am getting around to my build and have a couple questions. 1. I'm running a strictly 240 v control panel. Any issues with capping the neutral affecting gfci protection? One poster mentioned something to that effect but there was no further discussion. Just want to triple check. 2. The 3/4 cord grips I'm looking at also specify wire diameter. Does anyone happen to know diameter size needed for dryer cord power coming in? I just want to make sure I order the right sizes. 3. 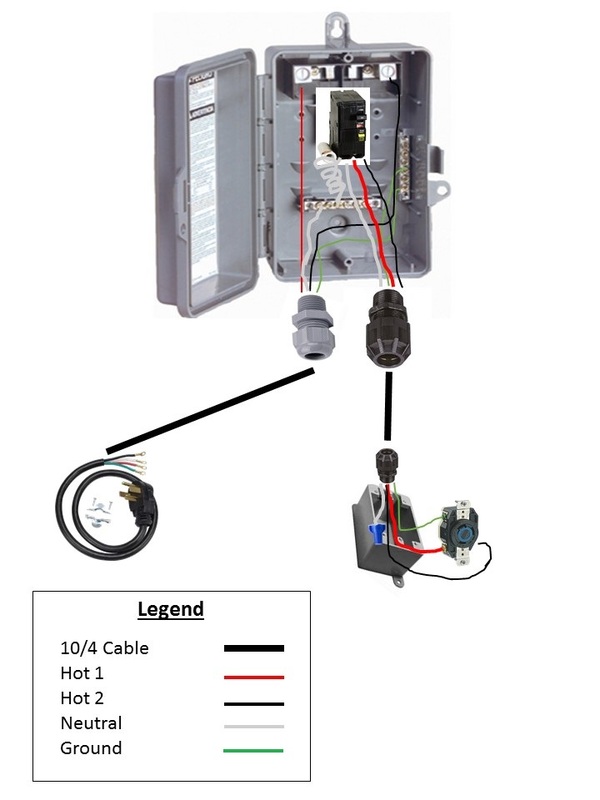 Any reason I couldn't install the receptacle for the control panel directly into the spa panel as opposed to running a cord out to the receptacle box as depicted in this thread? About to wire mine up, and just want to be sure... the INCOMING (wall to box) neutral plugs into the neutral tap on the GFCI. The PIGTAIL connects to the NEUTRAL BAR which then runs the OUTGOING Neutral to the control panel. No this is incorrect. There are two sets of wires that plug into the box, the line side (from the wall or main utility box) and the load side (where the load or in this case, control panel plugs into). The Line side neutral plugs into the neutral bus bar along with the pigtail off of the GFCI breaker. The Load side neutral plugs into the GFCI breaker itself. Make sure that the spa panel you have has a separate neutral and ground bar as they should not be tied together inside the box. This site has the clearest diagram that I have seen and can be modified for 3/4 wire 240V installations as well as a 120V branch circuit. The Line side neutral plugs into the neutral bus bar along with the pigtail off of the GFCI breaker. The Line side neutral plugs into the GFCI breaker itself. Hmmm... Those statements confuses me. 1. The pigtail on GFIC breaker goes onto your neutral bar. 2. The LOAD neutral (from your receptacle) goes to your GFIC breaker. Make sure that the spa panel you have has a separate neutral and ground bar as they should not be tied together inside the box. Absolutely... the NEC requires the neutral and ground to bonded ONLY at the main panel. Sorry wrote Line twice, I fixed it in the above post. you are correct, the Load (receptacle as in the twistlock receptacle the panel will plug into) neutral goes directly into the breaker. So here is hoping that I can fire this thread back up. First off, great write up. But I have some questions. I just inherited a nice electric brewing rig from a friend who upgraded to one of the SS systems. Super cool! But I have an issue with power in my home. I have a circuit that I can connect to, but it is only a 3 prong plug and the cable is only three.wires. HHN. How can I power my system safely using this setup? Would a spa panel work for this type of application? If your brewing setup calls for HOT/HOT/NEUTRAL/GROUND and you only have HOT/HOT/NEUTRAL, you'll have to get an electrician to install a ground line for you. A GROUND should always be used on any brewing setup. A spa panel does not add a ground. Thank you for the reply Kal! I guess I had some false impression from other forums that a neutral could also act as a ground. I’m not an electrician by any means so I’m full of questions. An electrician quoted me $400 just to run a new cable all of 10 feet. And that does not include a GFCI breaker for it. But I guess it’s the only option. I guess I had some false impression from other forums that a neutral could also act as a ground. Many years ago that was allowed, but today's electrical code in North America (I'm assuming you're from either the US or Canada) states that NEUTRAL and GROUND can only be bonded at the main electrical panel. It's not allowed elsewhere if you want to remain compliant. When in doubt always best to do things the correct/safe way. You electrician will (or should) know best and be able to assist with the safest/correct way.